The period between the First and Second World Wars was a time of great social change in Britain – a change which was reflected in the widespread popularity of the bold, bright, Modernist designs of the Art Deco movement. Art Deco Ceramics is an introduction to Art Deco British pottery and takes a look at the potteries and designers whose work is most valued by collectors today. All the usual suspects are present (Clarice Cliff, Susie Cooper, Wedgwood’s Keith Murray, Charlotte Rhead), as are a number of additional potteries that are sometimes unworthily excluded from these discussions. 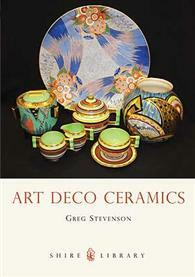 Art Deco Ceramics is a short book but author Greg Stevenson manages to include an impressive amount of important and useful information into its 40, A5-sized pages, making it a good introduction to the subject for new collectors. This book pre-dates Shire Books’ fairly recent acquisition by Osprey Publishing and the presentation of the book betrays this. Although the book’s cover is in the company’s new style, the formatting of the pages is a little dated and the photos are not always of great quality, especially when compared to newer Shire titles such as Clarice Cliff. None of this takes away from the quality of the information, however, which provides an excellent introduction to this popular area of collecting. This entry was posted in Reviews and tagged Art Deco Ceramics, book review, Greg Stevenson, Shire Books on April 12, 2011 by Perfect Pieces.